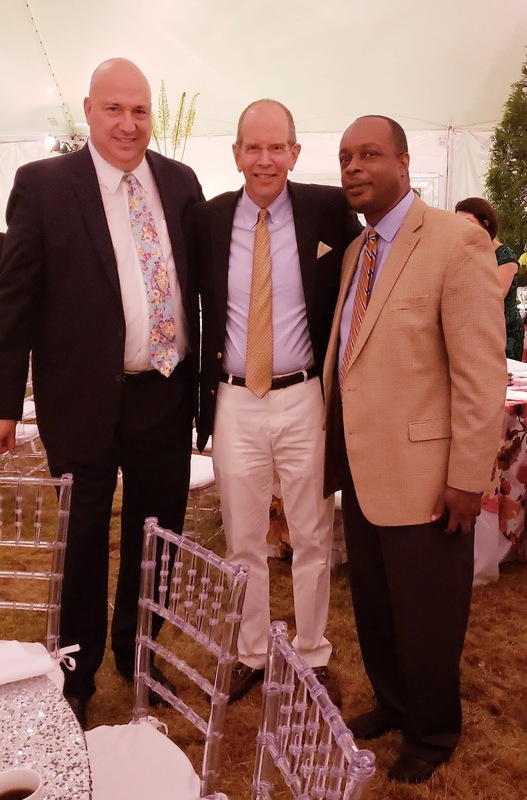 Southampton Hospital held its 60th Anniversary Annual Summer Party on Saturday, August 4th at Wickapogue and Old Town Road with cocktails beginning at 6:30 PM. This event, which is chaired by Douglas Elliman, is one of the highlights of the Hamptons season as illustrious guests arrive in droves to pay homage to this pivotal institution. Southampton Hospital which merged with Stony Brook in August 2017, remains the only facility on the South Fork-admitting more than 6,000 patients annually with 25,000 emergency department visits each year. This year’s honorees were moguls Bruce Mosler, Chairman of Brokerage at Cushman and Wakefield, and John Catsimatidis, CEO of Gristedes and United Refining Company. 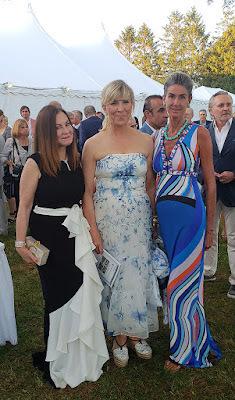 They drew an illustrious group including Somers Farkas, Judy Giuliani, Margo Nederlander, Maria Fishel, Sana Sabbagh, Howard Lorber, Kimberly Guilfoyle and eight hundred others. Besides the incredible guest list, another outstanding feature of the evening was it’s relatively cheap ticket price-for $500 you get cocktails, dinner, and entertainment. The food and decor were provided by event planner extraordinaire Larry Scott who knocked the crowd out with his delicious buffet dinner and sinfully decadent desserts. 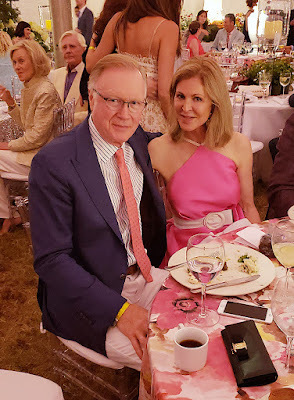 The red roses and table designs were perfectly executed, and Scott was the talk of the evening amongst discerning Hamptonites. If all that wasn’t exciting enough the emcee was star anchor Chuck Scarborough who thanked CEO of 12 years Bob Chaloner whom he called "the voice of the hospital." 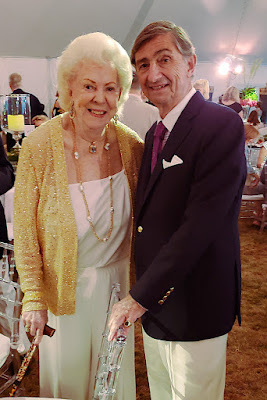 He also noted that under Bob's guidance the Emergency Care had been raised to level 3 and a cardiac catheterization unit has added which has saved numerous lives as well as the expansion of The Ellen Hermanson Breast Cancer Ward. Scarborough said that in 1958, the year the Hospital was founded, a number of momentous events occurred including the launch of the microchip and Harry Winston's donation of the Hope Diamond, which is now worth $250 million, to the Smithsonian. He urged guests to emulate Winston's philanthropy this evening which he acknowledged was the most significant fundraising event of the year for the Hospital with all proceeds going towards the John and Jenny Paulson Emergency Department. 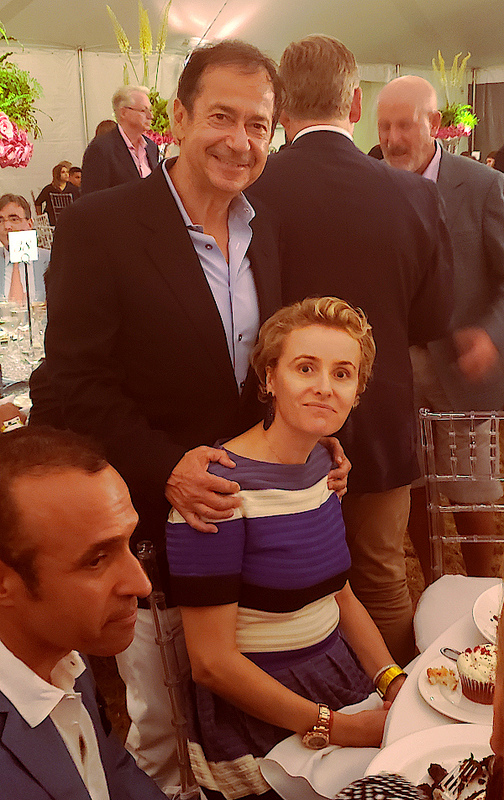 While John and Jenny are often traveling in August, tonight they attended with Paulson recalling The Hospital saving his father who had flatlined from a heart attack years ago; Paulson showed his appreciation by donating $5 million in 2009. Another philanthropic couple, Jean and Martin Shafiroff, who were President Committee Chairs of the evening bought two tables. Jean has tirelessly raised money for the Hospital during the past couple of years. Tonight Jean was resplendent in an orange Herrera gown that was simultaneously simple and breathtaking. 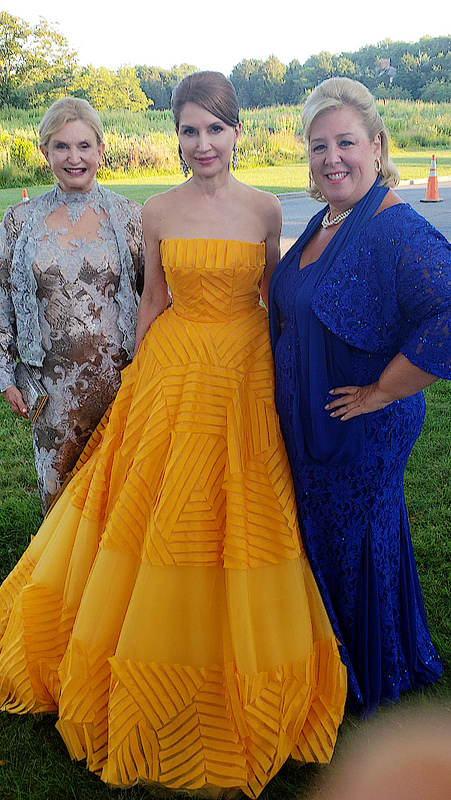 Accompanying Jean were her good friends' democratic politicians Rebecca Seawright, and Rep. Carolyn Maloney who were also fashion standouts-Maloney has my vote for the best-dressed politician. 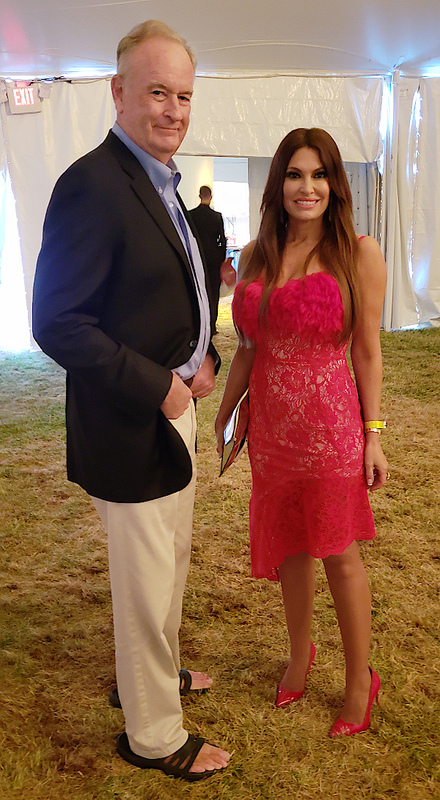 Representatives from the Republican side of the aisle also attended with former Fox News superstars Bill O'Reilly and Kimberly Guilfoyle making grand entrances. O'Reilly seemed a bit melancholy as he arrived in flip-flops and a button down shirt and spoke of his new book which he has been working on for the past year entitled "Killing the SS" which documents the Nazis who escaped persecution after the Holocaust. He and Guilfoyle were deep in conversation as dozens of guests approached O’Reilly remarking they missed his show. 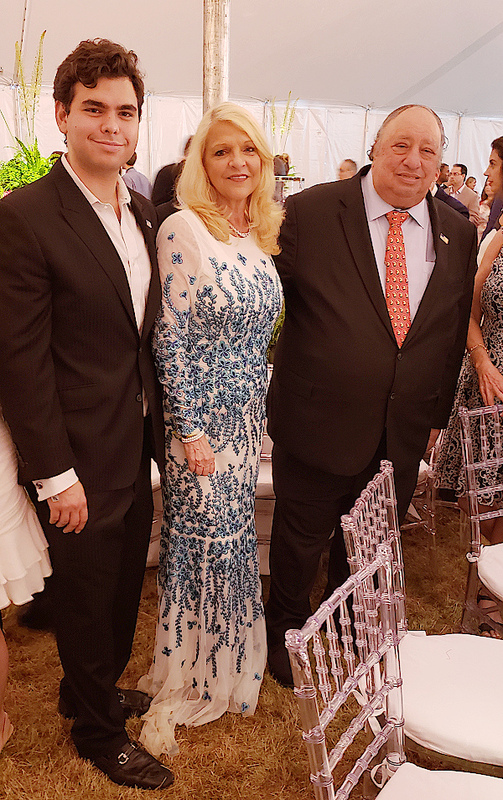 John Catsimatidis, another renowned conservative, said that he and fellow honoree Bruce Mosler were conduits to raising a few extra dollars for the Hospital and called on the community to chip in if a piece of equipment was missing. He said the definition of success was not how much money you amassed but whether you could make it to 95 or 100 years old - something the Hospital could help with. After the money raising portion of the evening, where $1.7 million was donated, guests danced enthusiastically to the energetic tunes of "The Groove." Scarborough later announced that billionaire Martin Gruss had won the $25,000 raffle - lending credence to the aphorism "the rich get richer."